Oregon: What is PowerSharp® ? PowerSharp® is a unique, proprietary saw chain and sharpening tool that gives the user the power to sharpen their PowerSharp® chain, on the saw, on the job, in seconds. The PowerSharp® system comprises four components that work together to provide a fast, simple and portable method of sharpening PowerSharp® saw chain. PowerSharp® Chain has unique, top-sharpening cutters and is low kickback per ANSI B125.1 and CSA Z62.3. Chisel-style cutters, ramped depth gauges and ramped guidance drive links provide a smooth and efficient cutting action and good chip flow. Look for the PowerSharp® diamond stamped on each cutter link. Only genuine PowerSharp® saw chains can be used with the PowerSharp® system. The sharpening stone fits inside the bar-mounted sharpener. 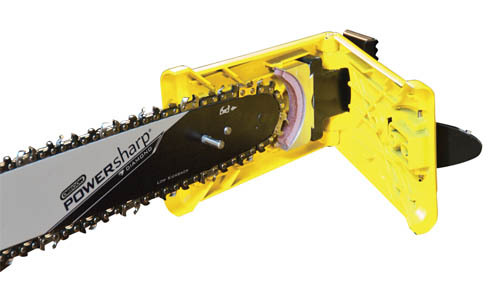 Matching the saw chain life, the stone should be replaced at the same time as the PowerSharp® chain. Lightweight and manoeuvrable, the PowerSharp® guide bar is designed as a direct replacement. Alignment and latch pinholes for the proprietary sharpening tool ensure perfect alignment between the cutter and the stone. Small nose radius helps to reduce kickback energy. Available in three lengths for the majority of saw mounts. Clamps over the end of the PowerSharp® guide bar when sharpening. The other contains the specific PowerSharp® chain and sharpening stone. To get started with PowerSharp® you will need both packs. The chain can be sharpened between 5 and 15 times, depending on the conditions. It must always be replaced at the same time as the sharpening stone. Available lengths: 2.3hp (42cc) and smaller. PowerSharp® chain: 91 Low Profile™ 3/8“ pitch, .050“gauge. PowerSharp® guide bar: 1 Low Profile 3/8“ pitch. Available Lengths: See petrol recommendations. Recommended electric saws: Motor rating of 1,300 watts @ 220V or greater. Sprocket 6 or 7 tooth drive sprocket.